What is an Assistant Trainer? An Assistant Trainer acts as the Trainer’s right hand, supervising stable staff and senior staff, their training, discipline and recruitment. You will set out the training schedules, liaise with owners and help with the overall running of the business. Assistant Trainers often represent the Trainers at races – saddling, dealing with owners, passing on Jockey instructions, and handling general PR. For many Assistant Trainers this is a stepping stone to becoming a Trainer. It’s a position that requires considerable experience of managing or riding racehorses at a high level, and most Assistant Trainers have, or are working towards, a Level 3 Apprenticeship Senior Equine Groom (Racing) (formally the Level 3 Diploma Advanced Apprenticeship), which you can attain at the British Racing School. As an Assistant Trainer you will be paid in line with, or above, the highest pay grade. You will also receive pool money, but most importantly you will gain invaluable experience and if your ambition is to become a trainer this is an excellent path to take. I grew up on a farm with both parents interested in racing, having hunt and point to point horses of their own. I had a Shetland pony that I loved to go fast on, even with little control. So after my GCSEs, instead of taking A-levels , I decided to go to The British Racing School. I began my training in racing with the nine week foundation course in 2008, completing my NVQ 2 with Mr Cumani in Newmarket along with my NVQ 3 in 2010 and holding my apprentice jockey license in 2011/2013. In this time I also attended the bookkeeping course and the Trainers module 1 course in 2015. My dream ambition would be to have a yard full of racehorses trained under my name but due to lack of money and backing, a more realistic ambition would be becoming an assistant to a slightly larger trainer ,that holds a high strike rate of winners to runners, or even having my own business specialising in breaking-in young horses and rehabilitation. I enjoy my job purely because I’m now in the position to be able to put all my experience of the racing industry from my 10 years in the industry to practical use; advising and teaching less experienced staff, educating horses and seeing to their welfare and care. Also Chris Wall is one of very few trainers left in Newmarket to still break-in, back and ride away their our yearlings, which I love doing as it’s very rewarding to see the young horse learning and accepting it’s education. The Assistant Trainers Course is a residential course which illustrates the importance of an Assistant Trainer both in the yard and on the racecourse. 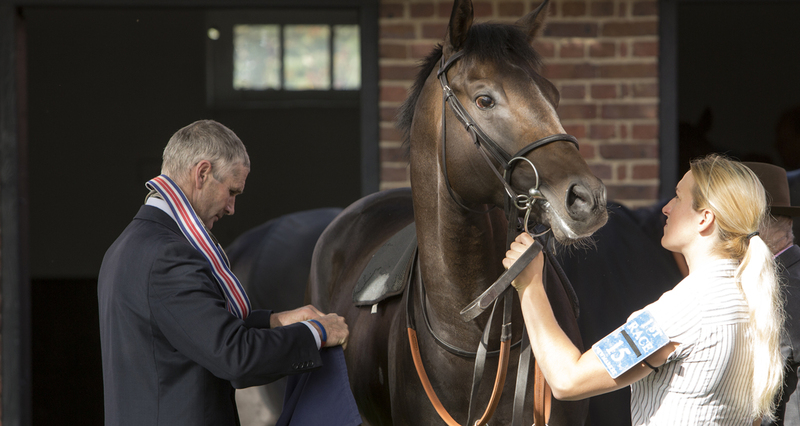 The Level 3 Apprenticeship Senior Equine Groom (Racing) is a highly valued, industry recognised, advanced qualification, required for the top positions in the horseracing industry.